Welcome to my nalbinding site! Instructions can be found in the menu Step by Step. 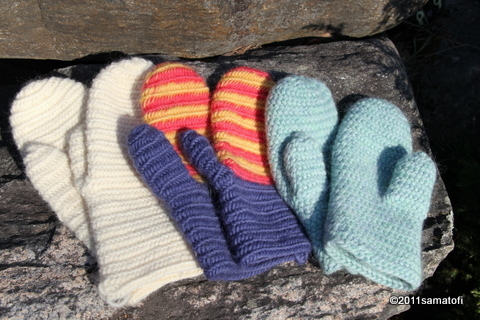 There are instructions for how to start nalbinding, how to join the pieces of yarn together, how to increase and decrease, how to finish off the work, and how to make a thumb. 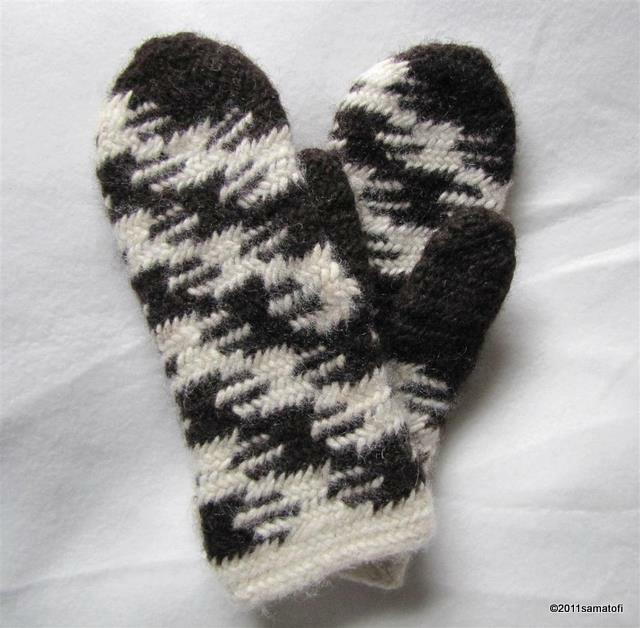 There are also outline patterns for nalbound mittens and socks in different sizes. Under Videos menu there is a list of the nalbinding videos I have made. The videos have been listed under separated headlines, for example how to start nalbinding, and how to continue to the second row. In the submenus of the main menu you can find a few words about the history of nalbinding, Hansen's Notation, stitch classification by Kaukonen, nalbinding needles, and a list of nalbinding books and magazine articles. Different nalbinding stitches have been categorized according to the stitch classification by Kaukonen: Finnish, Russian, Turning, and Other nalbinding stitches. There is also a nalbinding stitch index here. For nalbinding you need a large needle (a darning needle works fine, too), and longish pieces of yarn, usually woollen. In nalbinding the yarn does not run from a ball of yarn. A right-handed person holds the work in the left hand and the needle in the right hand. The work progresses from left to right. The needle is 'woven' into the previous loops in a certain order, and it is not possible to undo a nalbound fabric simply by pulling the yarn, like you could undo a knitted piece. Instead, nalbound fabric is undone by pulling the yarn out of the loops, one loop at a time. Nalbinding is an ancient handicraft technique which has been known in many places around the world at least in some period in the history. Other words used to describe nalbinding are for example naalbinding, nalebinding, naalebinding, nålbinding, nålebinding, needle binding, nailbinding, looped needle-netting, needle coiling, knotless netting, and single needle knitting. one generation to another even till the present day. Although some men have nalbound, too, it was thought that not knowing how to nalbind mittens or socks was a shame to a Carelian woman. 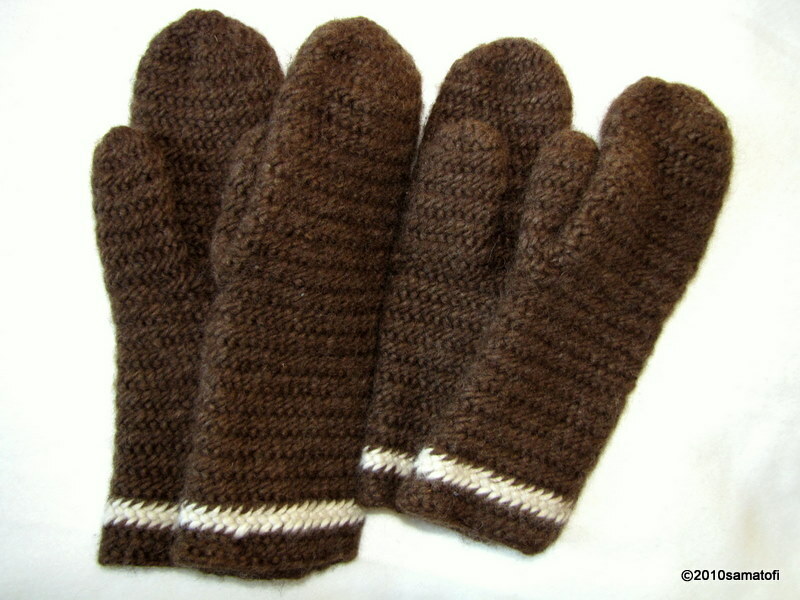 In the past nalbound mittens were appreciated and they were also valuable. They have been used to pay war taxes, and compensations for church clerks who performed engagement and wedding ceremonies. On this website I often refer to the Finnish nalbinding article written by Ms Toini-Inkeri Kaukonen in 1960. She wrote her article based on the national nalbinding survey made by National Board of Antiquities of Finland in 1957. Kaukonen noted that several different nalbinding stitches were known in Finland, and she categorized these stitches in three groups* which she called Finnish, Russian, and Turning Stitches. On this website I use also a fourth group, Other nalbinding stitches, because there are stitch types which do not fit Kaukonen's classification. There are numerous nalbinding stitches. There are also various ways of holding the work and manipulating the loops. Some people prefer to work flat, without thumb loops, while others prefer to keep one or more loops around their thumb. Your way of nalbinding is by no means wrong although it might look different from someone else's, and you might even invent a stitch of your own. *) Outside Finland the term "Finnish Stitch" usually seems to refer to the Finnish Stitch 2+2 (UUOO/UUOOO; 2 loops around thumb, 2 behind thumb), and the term "Russian Stitch" to the Russian Stitch 2+2+2 (UUOOUU/OOUUOOO; 2 loops around thumb, 2 behind thumb from front to back, 2 behind thumb from back to front (needle tip pointing to left)). In Finland, however, these terms "Finnish" and "Russian" refer to the way of making stitches, and they cover not just one but many stitches. 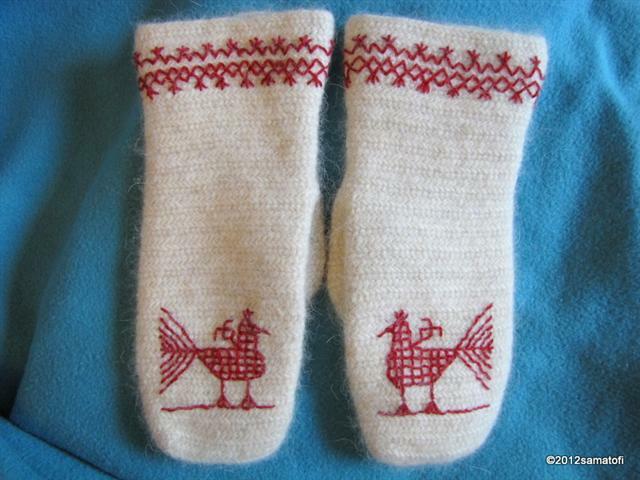 That is why I would rather talk about the "Finnish Stitch Family" and the "Russian Stitch Family".